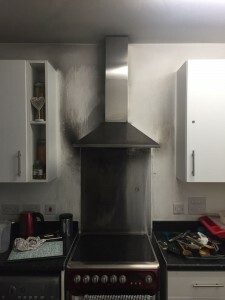 On 24th March at 21:00 hrs, a sprinkler system installed by Triangle Fire Systems successfully extinguished a chip pan fire at an apartment in a 9 storey residential building in Blackwall, London. We supplied, installed and commissioned the fire sprinkler system in July 2014 in accordance with BS9251. One VK457 sprinkler head was activated and extinguished the fire within 5 seconds, and as a result the only damage was from smoke and less than 5m2. The occupier was very impressed with the speed in which the sprinkler extinguished the fire. The fire brigade arrived 20 minutes later and the attending fire crews stated it could have been a major fire without the intervention of the fire sprinkler system. Our engineers have subsequently attended site to replace the single sprinkler head and reinstate the system to full operational use.